As the #1 mobile banking provider in Poland, mBank continues to innovate and be recognized by evaluation organizations worldwide such as Finovate, Forrester, TechCrunch and others. I interviewed Michał Panowicz, mBank’s Director of Marketing and business development of retail banking to get a perspective on mBank's success. 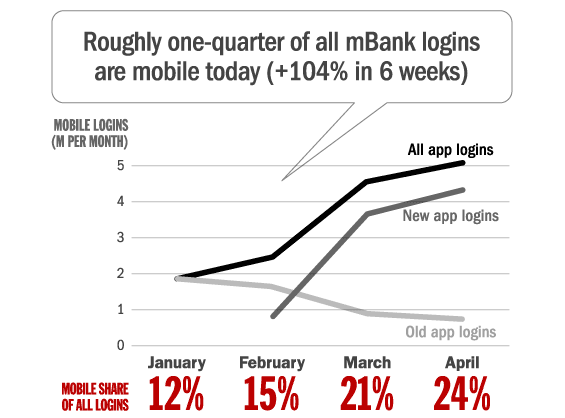 In Poland, mBank already is the #1 mobile banking provider by a large margin, with 724 thousand customers logging into any type of mobile banking service at least once a month in Q4 2013. This gives mBank a strong 29% market share. 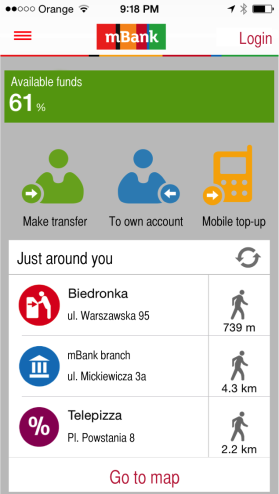 First versions of mBank’s mobile application were started in 2011 and by February 2014 were installed on 446k devices. These apps provided information access to nearly all customer’s products and allowed money transfer transactions and mobile deposits. 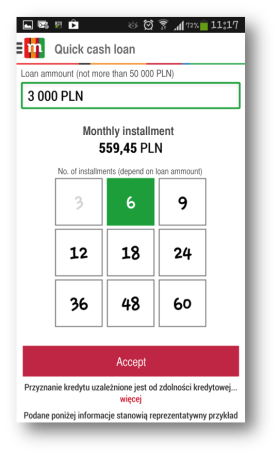 Even in a “Mobile Banking 1.0” transactional format, the application was deemed as the most comprehensive from a functionality perspective in Poland as underscored by being number one in customer installs. Work on the new mBank platform lasted for 14 months and was carried out by a 200-person team. Acceptance by customers has exceeded expectations and new functionality is introduced regularly, allowing the mBank mobile product to maintain its high ranking in Poland, Europe and worldwide. 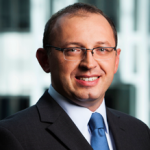 The following is an exclusive interview I had with Michał Panowicz, mBank’s Director of Marketing and business development of retail banking on the innovation that helps define mBank. Can you describe the origin of the mobile component of mBank? Most banks started and still are in “Mobile Banking 1.0” which is what they do online – “table based banking” – only compressed into 3.5 inches. This only makes the experience somewhat dreadful. Since the first iPhone, mobile capabilities have expanded dramatically: screen, battery life, CPU, bandwith, UI and foundational services like geolocation. 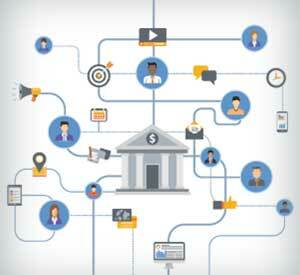 This creates powerful momentum to re-think and re-invent mobile banking. This is how we approached our new mobile apps. We started from a white sheet of paper asking a question – what does a modern mobile service look like. Regardless of genre. 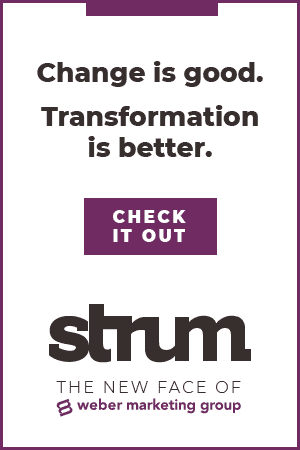 Only after knowing that, we started re-shaping banking processes and products to fit mobile, rather than cutting the corners of mobile best practices because we did not want or believed we could not change our internal processes or thinking. Was the mobile solution built on a completely new platform or within an established back office? 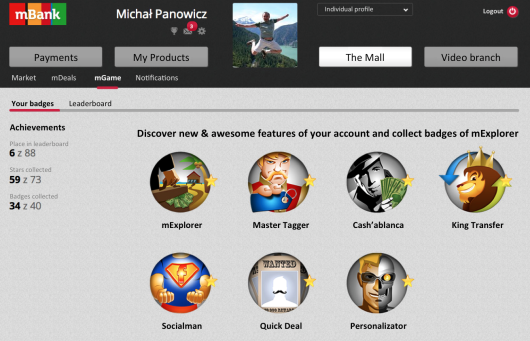 The core frame of our new apps (iOS, Android and Windows Phone) was envisioned, designed and coded from the ground up. We designed mobile services to encompass the latest and greatest mobile capabilities and UI benchmarks with virtually none of this coming from finance. What truly helped is that we started working on our new mobility after a fundamental overhaul of our online banking and its core functionalities, including some foundational back-end systems and services. For example, we could deliver and optimize mobile scenarios for a number of services which we already had online, such as instant search (which is irreplaceable on mobile as it cuts typing to a minimum), account aggregation and filtering, merchant funded deals (greatly enhanced by geolocation scenarios), real-time CRM (which is great for relevance and timeliness of notifications) and PFM. None of these were copied 1:1. But, having a technology stack in the back, which already was taking advantage of full customer info and relationship, meant that we could build a service on top which did not have to recreate or duplicate the core, but could be rendered with full alignment with the DNA of the requirements of mobile services. What are the objectives of the mobile offering and how are you trying to differentiate your mobile solution? As a consumer facing organization and brand, we need to be where consumers are. So we need to deliver scenarios on devices which have become the most frequently used items in our lives. Simple as that. The first objective is to deliver transactional services which are in tune with mobile context, such as account balances, account history, money transfers, bill pay and information on the status of products the customers have. Even though all banks claim to provide this functionality today, the question remains as to how ‘mobile’ they really are? Are they fully optimized to give instant gratification, to be in synch with the small screen and touch UI, leverage the time, geo and presence context of the user? Our second objective is to be able to offer advice and sales on mobile. Mobile is not yet a huge substitute to online traffic – it creates new touch points. But, it will start to cannibalize branch and online traffic soon. And for that, you’d better be prepared to engage and sell beyond transactional banking … which is a core of the relationship, but not core to banking profitability. As an example, we forced our organization through a very difficult process of creating a truly mobile installment loan process. To make this process mobile, we found a way to perform loan underwriting and credit scoring in 30 seconds. There is no paper or branch involved – make a request, tell us the term, done! Money transfers instantly into the customer’s account. The customer can repay with debit, go to an ATM, do bill pay or transfer funds. Liquidity is provided for the customer to use any way they want. Through such scenarios, we want to gain experience on how to adjust engagement and sales on mobile. This is a really big challenge, not just for banks. Look at e-commerce, and how much online stores are challenged. Look at how much effort Facebook and Google have gone through to adjust their advertising businesses to mobile. And ads are way easier than transactional services, financial services or buying and selling merchandise. When deciding on a new functionality (such as the 30 second mobile loan), how is the solution selected? Is it based on customer input or corporate objectives? 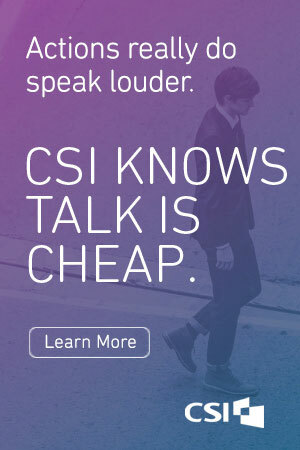 We do it in an ‘expert’ mode. 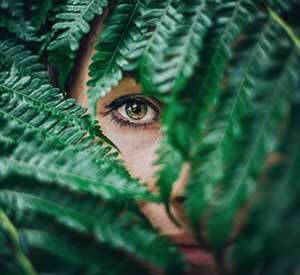 At this stage, asking consumers directly does not provide well-informed guidance since it is hard for consumers to understand what they have never seen before. What are the capabilities of mobile – what can you render on the devices, what’s changed from the last time we developed apps, what’s on the roadmaps of OS suppliers and OEMs? 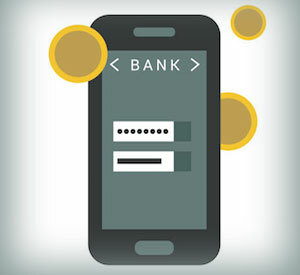 When, and in what context, do people use their devices … not just in banking, but in general? What are the “genetic” differences in UX of consuming, manipulating or creating content on the devices and how are these scenarios enabled by best-in-class apps and services? Given the above, which of the hundreds of financial scenarios are most likely to shine on mobile, which will be horrible, which are not ready yet and which will require consumers to first acquire the basic skills and self-confidence with the channel to progress? We also know that in this wave of adoption, it is more about being at the front of the adoption curve. So, the design can be more adventurous and progressive since you do not have to be afraid of late adopters or laggards. These consumers are not there yet, and will not be for a time, so you do not have to optimize the design for them (yet). So it is a very consumer driven process, yet without asking consumers directly. As with 30 second loan, we knew that the shorter the time to approval and disbursement, the better. So, we designed a loan product form which has only one mobile screen and takes only two inputs – the amount the customer wants to borrow and the number of repayment installments desired … nothing more. It takes 10 seconds to complete. 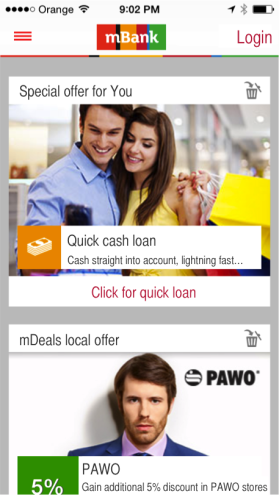 We wanted to have a truly mobile sales process with a very difficult product – a consumer loan. That’s how you advance your organization on the experience curve. After accomplishing something really hard, we now have even more courage to advance in mobile sales. Most scenarios will be easier, at least on the back-end side. How long does it normally take from concept to roll-out and what determines if the solution should be rolled out? Our current cycle it is relatively long – 6-8 months. But, we talk not just about features, but comprehensive rollouts of the whole system across the bank. I would love to bring this process down to 1-2 month release cycles in the future. We do not do beta-tests on ‘coded products’ at the moment. I believe we have done designs which were not farfetched enough from the mobile UI metaphors to heavily invest in beta. However, we do extensive testing on the basis of wire frames, architecture of information and designs. We typically include a few weeks of family & friends testing prior to running the service publicly to users. What have been the most successful functions introduced by mBank and what determines success? Pre-login functionality: These are the functionalities available after a single tap – still before the login and authentication. It is harder for banks to keep sessions open and let you into the app prior to confirming your identity. This hugely differentiates banks from pretty much all of the most popular services, like social, music, information and entertainment services, even email access.So, our app at launch gives a customer the most important info they always check: balance of checking, usage of credit card balances, sanitized transaction alerts, merchant funded deals, product offers, proximity to branches, ATMs and offers. This has been a big benefit for our customers. We make sure it is secure from both a legal and consumer perspective. For instance, balance is given as % of a number a user picks in private – so the user knows the balance but the % is not meaningful to anyone else. Login and authentication PIN: Another feature is the PIN enabled login and transaction authentication. The online password and login take at least 30-60 seconds to get into the app or much longer if the customer has a proper, long, secure password with lots of special characters. The PIN eliminated mobile one time passwords – which have horrible UI because the customer needs to wait for them (it takes many seconds and sometimes carrier networks have even larger latency). Then they need to be re-typed, hopefully without errors. We worked hard with engineers, security, compliance and legal to enable device pairing. We did the heavy lifting so that the users could have a truly mobile experience. 30 second loan: The 30 second loan is a big hit. While we can not give the numbers yet, the product has orders of magnitude faster adoption than we expected. It has also made a lot of impression on experts and analysts around the world. Why does there seem to be so much online and mobile innovation in Poland compared to other countries like the UK and the US? Not unlike other areas of the world, we have a very competitive and dynamic banking sector, not just in mobile. In my judgment, it is a combination of 1) a consumer banking sector that started just 20 years ago (adoption of banking by huge swaths of non-banked) which meant high user growth; 2) economic development without any large crisis which led to value per consumer growth; 3) regulators supporting competitiveness; 4) new entrants willing to accept technology, legal and process innovations, and: 5) many new and successfully scaling banking startups such as mBank, Lukas Bank, Eurobank, Polbank, Getin or Alior, all within just slightly more than one decade. 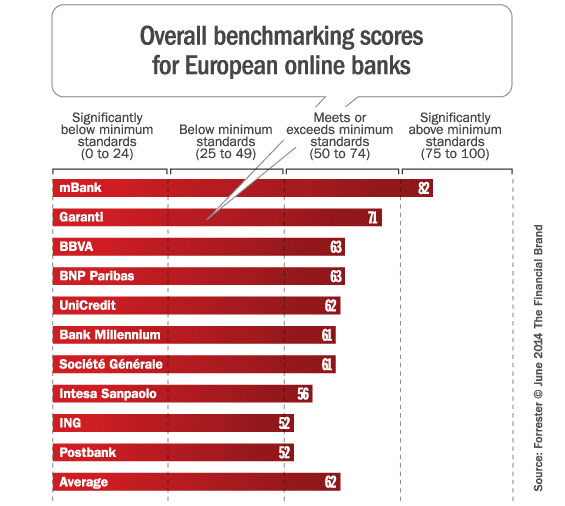 In this context, mBank, the pure online bank, has grown from zero to #3 in Poland, demonstrating to the rest of the industry that digital banking is a serious alternative to traditional models. Since all others in Poland ramped up investments in electronic channels and kept the spiral of competitiveness, it is really hard to remain in place. I believe Turkey is in a similar situation – a super competitive and advanced retail banking sector with bankers looking over their shoulders at what their friends have done just yesterday. Specifically, in the beginning of Q3 we will roll-out a massive cooperation with #1 telco in Poland – Orange. In this situation, we are building a fully-fledged white label bank in a record time of 6 months. Not just checking, but a full range of services. This will be one of the first cooperations with a telco on such scale and scope. We hope to reach their 15 million of accounts. At the same time, we will be launching a unique mobile payments service. It stands out on a global scale since it is borne out of a cooperation among 6 top banks (~70% of market share jointly) to deliver a joint mobile payments service in online and offline POS. It is being done without the major card companies. The service is already operated by the #1 bank in Poland – PKO BP, so we will scale it up significantly both on consumer as well as merchant side of the platform. We hope it will establish it as a de facto standard for mobile payments in the country. On mBank side it will be integrated with our application, including PFM and merchant funded deals support. Beyond that, we will keep investing heavily into mobile in general, mobile selling scenarios, video banking, algorithmic relevance engine for all our channels, extending our payments marketing platform. We do not see a possibility to slow down any time soon. This article was originally published on June 9, 2014 . All content © 2019 by The Financial Brand and may not be reproduced by any means without permission.